I’ve always loved anything pumpkin! Pumpkin pie, cake, cookies, bread, butter, beer, pumpkin pie scented soap. My husband puts up with this - in fact, he can really get me going on the silliness of it all (but I really DO love pumpkins). One fall I came home with pumpkin coffee - I really thought I had the mother load of pumpkin goodies - what else could they possibly make out of pumpkin? Alas, my husband said I’d gone over the deep end. And you know what? He was right! That coffee was the vilest pumpkin-flavored item I had ever tasted! For now I stick to my favorite - pumpkin pie! I found a recipe in Sunset magazine several years ago that called for using Soy milk instead of regular milk in pumpkin pie. I don’t make it any other way now! The soy milk lends a sort of “nutty” flavor to the mix and you’d never know it was there! A caution, however, use regular, not flavored soy milk. I would print the recipe for you, but being new to blogging, I’m not sure if it’s appropriate and or “legal”. So if anyone would like the recipe, please feel free to email me and I will be happy to send it to you. We don’t have to worry about the flavor of this table runner pattern from Artful Offerings, thank goodness! I really like their products, which can be ordered from Homespun Hearth. 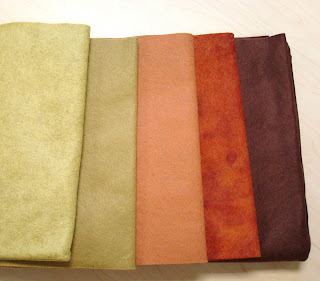 I purchased the pattern last fall, along with this fabulous hand-dyed wool felt, but never got around to making it. Now that my stitcheries for Winter Wonderland are done, I feel naked in the evenings without something to stitch. So I got it out and will begin in earnest tonight. My husband is the pumpkin lover in our family. Using soy milk sounds intriguing. I'll have to try that and see if he notices. Thanks for the tip! ... yeah, pumpkin coffee doesn't sound very appetizing to me. Coffee just shouldn't be messed with. Pure and straight up, that's what I say. Maybe a little bit of milk. But that's where I draw the line. I went to Sunset online recipes and found this--could this be the recipe? SNAP!! 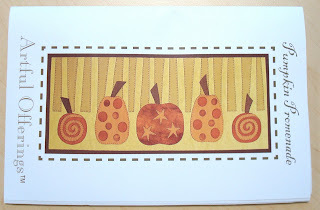 That is cute, cute pumpkin table runner. Love the design and with wool! hmmm...not too much of a pumpkin lover. my husband however, INSISTS on pumpkin oreo shakes EVERY year, around this time. ick. yea...see? we're not too much the healthy ones. That's going to be a gorgeous project. Love the pattern and the felts. I've never worked with wool or felt. Can't wait to see it completed. I'm not so crazy on pumpkin food but my husband is. I do have a good recipe for pumpkin bread, that's about all I need. I do love pumpkin candles, though!